I love making cookies, and my daughters love coming home to freshly baked cookies after school. I have them lined up on cooling racks, and they run straight through the door and into the kitchen. So, I am always looking for a new cookie to experiment with, and if I can make it a bit healthier…it is a bonus for both the kids and me. This week, I made biscotti. 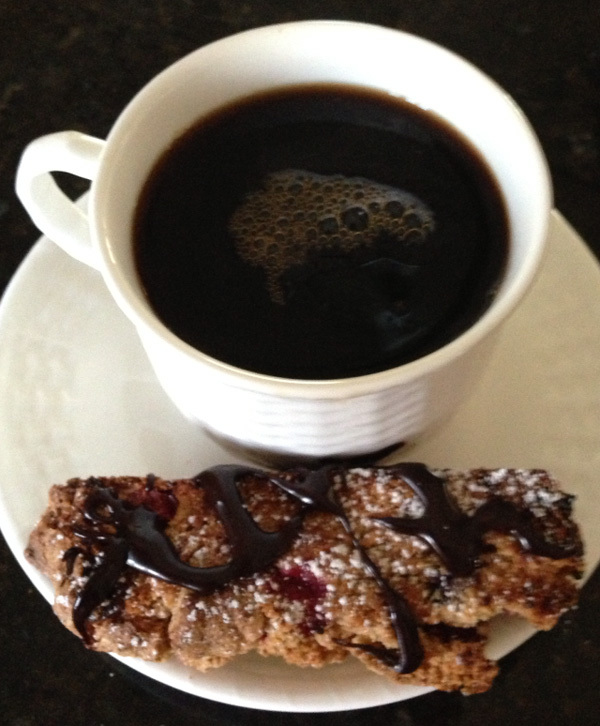 Biscotti are so versatile because you can add virtually any flavoring you like, and they have a pretty long shelf life if stored properly. I found a recipe for citrus biscotti and changed it around a bit (I used wheat flour instead of white and added fresh cranberries that I keep in my freezer). The result was quite tasty, and the cornmeal gives them a nice crunch! Mix the flour, cornmeal, baking powder and salt in a bowl. Using an electric mixer with a paddle attachment, mix the eggs, sugar and zests together until the eggs are pale yellow. Add the dry ingredients to the egg mixture, and mix until just incorporated. This is a very sticky dough. Stir in the cranberries and white chocolate chips. Transfer the dough to the baking sheet and form two logs (about 11 x 4 inches). Bake for about 30 minutes, until the logs are slightly golden. Cool the logs on the cookie sheet for 8 minutes, then cut the logs crosswise (using a serrated knife) into ½ inch thick diagonal slices. Arrange the biscotti cut side down on the baking sheet and bake until they are pale and golden (about 5- 8 minutes on each side). Cool the biscotti for 5 minutes and then transfer to a cooling rack. Place the bittersweet chocolate chips in a bowl and microwave for about 1 ½ minutes (stir every 30 seconds). When the chocolate is smooth and melted, drizzle onto each biscotti or dip one half of the biscotti into the chocolate. The Elegant Occasion Note: If you prefer you can sprinkle confectionary sugar over the cooled cookies instead of drizzling chocolate. The Elegant Occasion Note: Store the cookies in an airtight container for up to four days. These cookies can also be frozen for up to three weeks. Some friends of ours invited us to dinner on Friday night. It is always a treat to spend time with them, and as we are all “foodies”, we love trying new dishes. We went to a restaurant in Westport that my friend had heard good things about; LeFarm. After going on their website and reviewing the menu, I learned that their mission is to keep the food fresh and local with the help of various Connecticut farms. The website has such an “earthy” look to it that I actually expected to find the restaurant located in a small farmhouse, but instead we found LeFarm tucked into a strip mall off the Boston Post Road. It was casual and cozy, and the minute our server greeted us with his friendly, welcoming smile, I knew we were in good hands. The menu has many offerings, most of which are served as small plates. We each ordered an appetizer and agreed to share so that we could all try a bit of everything. The Cavatelli with Lamb Bolognese, Seared Local Swordfish (raw), and Fried Risotto Balls were all absolutely delicious! But, what captivated me was the Kale Salad. I have been eating healthier and watching my caloric intake (which is not easy the way I cook), so I chose the Kale Salad thinking it would be more figure friendly. When I took the first bite, I was intrigued…so much so, that I had to have another bite quickly. The brightness of the lemon, the saltiness of the anchovies, and the bitterness of the kale and radicchio all worked together brilliantly (I think there might have been some duck bacon fat in there too). The salad was topped off with mounds of shaved parmesan, and it struck the perfect balance. In fact, it was the type of dish that left us going back again and again until it was gone. We had a wonderful time at LeFarm. The food and the company of our friends were both delightful. I woke up on Saturday morning wanting more of that Kale Salad and decided to try to recreate it as best I could with ingredients I had in my fridge and pantry (I used olive oil in place of duck bacon fat). Here is my version of the salad…which I made for lunch Saturday, as a side to dinner on Saturday evening, and my daughters and I ate it again on Sunday. Shred the vegetables and make the dressing in advance, and put it all together before serving. This dish is a must for entertaining. And to our friends, thanks for a wonderful evening, and here is to many more! In a food processor combine the anchovies, lemon juice, zest and garlic. Slowly add the olive oil until the dressing emulsifies. 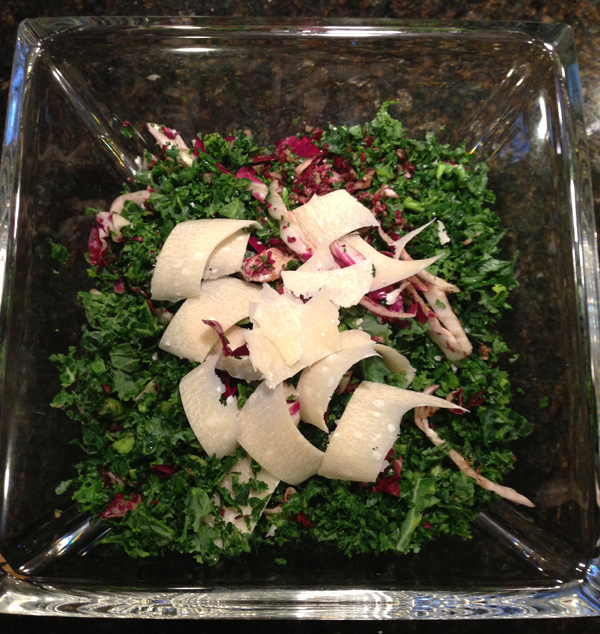 Place the shredded kale and radicchio in a large bowl and add half of the parmesan cheese. Just before serving, pour half of the dressing into the salad and toss. Check for seasoning and add some black pepper. If you need salt, by all means, but the anchovies should take care of that. Divide the salad among four plates and top with the remaining parmesan cheese. Recently I have been obsessed with making ice cream. I fantasized about making different exotic flavors, testing my creativity and making some outlandish concoction that my family raved about, and of course, I just knew that someday it would be the topic of one of my shows. But whenever I told my husband about my grand plan to make my own ice cream he would laugh. What was wrong with Haagen-Dazs or Ben and Jerry’s? Why did I need to re-create something that had already been created…and very successfully? After almost twenty years together, clearly he was not sharing my vision on this issue…yet! So, the other day when I was perusing the house wares section at Page Hardware and Appliance Company, I came upon ice cream makers. I was dazzled by the array of colors and the brand choice. Should I get Cuisinart in a cool ocean blue, or a KitchenAid that attached right to my standing mixer, or maybe the cute little Hamilton Beach Half Pint? So many choices….I finally decided on the KitchenAid. I got my new ice cream maker home and quickly put the bowl in the freezer (as it needs to freeze for 15 hours), and the next morning I got up at 6:00 a.m. and began making the base for three different ice creams (starting out relatively simple): chocolate gelato, vanilla ice cream and lavender vanilla. By the time my daughters got home, all three flavors were in the freezer, and the ice cream scoopers were ready for action. The smiles of pure joy on my girls’ faces and the exclamations of “my gosh mom, this is the best ice cream we have ever had!” delighted me, and I knew that my intuition had been right. Then my oldest daughter said “Mom you can never buy store-bought ice cream again!” Oh boy, what did I get myself into? I was talking to my girls and teasingly told them that if The Elegant Occasion did not work out, I would hang a shingle and open up an ice cream shop. My middle daughter, Isabella, got all excited and said “Mommy, you can call it Lombardi Swirls.” I loved it! Once a month between now and summer’s end, look for a new ice cream recipe from me…some will be on the interesting side (for instance I want to try one made with goat cheese), and some will be fun and fruity, but I am betting they will all be delicious. PS: Want to try my ice cream? Come to Page Hardware and Appliance Company in Guilford on Saturday, May 4th between 10 and 2. We are celebrating Mother’s Day, and all proceeds go to The Columbus House. I will be making ice cream for everyone! In a sauce pan over low heat, stir together the milk, heavy cream, ½ cup sugar, cocoa powder, bittersweet chocolate and espresso powder. Heat until the sugar and chocolate melt, but do not let milk mixture boil. When the sugar and chocolate have melted, and the consistency is smooth, take it off the heat. In the bowl of an electric mixer with a whisk attachment add remaining 1/4 cup sugar. Whisk on high speed until the yolks are pale and the mixture has doubled in volume. This takes approximately five minutes. Slowly, add the milk and chocolate mixture into the egg yolk mixture and whisk for another 30 seconds to incorporate. Pour the entire contents back into the saucepan and cook until the mixture thickens. Be sure to whisk continuously. Do not allow the mixture to boil. Strain the gelato into a large glass bowl and stir in the vanilla and the salt. Lay a piece of plastic wrap over the top of the gelato so a skin does not form and place in the refrigerator for four hours. The gelato must be chilled completely before putting it into the ice cream maker. Once your gelato base is thoroughly chilled, pour it into the ice cream maker and follow your specific brand’s directions. 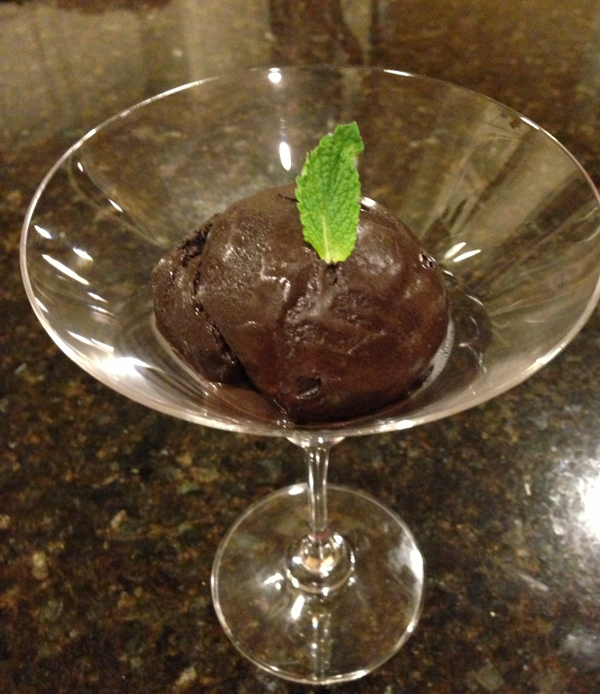 For the KitchenAid ice cream maker, mix the gelato on the “stir speed” for 20 minutes. Pour the gelato into a container with a lid and freeze for six hours. The Elegant Occasion Note: Homemade ice cream is a much creamier consistency than store-bought. When I was growing up, at least one Sunday a month, we went to see my father’s family (located in Rome NY, about 30 minutes away). My father’s dad had died before I was born, but my grandmother (who spoke no English) and my father’s four sisters still lived in the same place in which my dad had grown up. All of my aunts were wonderful cooks, and I loved having Sunday dinner with them. It was loud, it was crowded and it was incredible fun. Dinner would start with an antipasto salad. Pieces of Salami, Cappicola and Provolone would be tossed into fresh greens. Roasted peppers, capers and olives would add spice and saltiness, and then we would top it off with red wine vinaigrette. After antipasto came platters of roast chicken and potatoes. The chicken fell off the bone and was infused with rosemary and lemon. It was followed by pasta with red sauce, and of course, crusty Italian bread. It was a feast! I loved those dinners because it meant togetherness for my family, and those memories left a huge impression on me. That fall-off-the-bone chicken is now a staple in my house throughout the year; in fact, it is my husband, Tom’s, favorite meal. It’s a great dinner for any night of the week, and it’s a great entertaining meal, because it makes people feel comforted. I made this recipe for the pilot show I did in 2011 (you can watch the show under “summer”). Since then I cannot tell you how many people have written to me with stories of how their family loved it. In fact, several ladies have used it to snag the man they want to marry. I am going to rename it, Engagement Chicken. Place chicken in roasting pan and drizzle with olive oil. Season the chicken generously with salt and pepper. In a large bowl toss carrots, potatoes, shallots and garlic with olive oil, salt and pepper. Add vegetables to the roasting pan with the chicken. Squeeze one half of the lemon over contents of the roasting pan. Cut remaining half of the lemon into four pieces and add to the pan. Toss in the rosemary sprigs. Place roasting pan in 375 degree oven for 10 minutes. Turn the oven to 350 degrees and continue to roast the chicken and vegetables for another 20 minutes. Toss the vegetables and then continue to roast for another 30 minutes. Remove roasting pan from the oven and transfer chicken and vegetables to a serving platter. Place foil loosely over platter to keep warm. Whisk until combined, and bring to simmer for 3-5 minutes. Taste for seasoning, pour juices over chicken and vegetables, and serve. I happen to love Panzanella (zesty bread salad). Usually, it is a staple in my house through the warm summer months, as it goes with just about anything you can think to grill up, and you don’t have to worry about it turning in the sun, as you would a mayonnaise based salad. Bread is my weakness, especially crusty, rustic bread. So I was curious to see what else I could do with the concept of a bread salad, and make it applicable to any season. I began experimenting with a Breakfast Panzanella…think of this as a breakfast parfait, only instead of granola; you use toasted bread that has been coated in delicious syrup. I add cognac because it gives a deeper layer of flavor to the syrup, but you can omit this step if you like. This is the perfect breakfast to begin Easter morning. Whip it up in a matter of minutes, and enjoy it while the kids are digging into their Easter baskets. It is also a great dessert, if you substitute fresh whipped cream or gelato for the yogurt. Want to see how it is prepared? Watch the new video…you will find it under spring and Holiday shows. I wish you all a very happy Easter! And I thank you for allowing me to share my passion for food and family with you! Cut and cube an entire loaf of Ciabatta bread and place it on a parchment lined baking sheet. Place the bread in a 375 degree oven for 15 -20 minutes until the bread becomes golden and crisp. Turn the bread cubes once during the cooking process. Remove from the oven and let the bread cubes cool. The Elegant Occasion Note: You can make the bread up to this point, 24 hours in advance and store in an airtight bag or container. Toss the strawberries in a large bowl with the fig balsamic and lemon juice. Let the berries macerate for 10 minutes. While the strawberries macerate, make the syrup. Melt butter and sugar in small saucepan. Add the lemon juice, orange juice, salt and brandy. Let the mixture cook until the sugar has melted. Toss the cooled bread cubes into the syrup and stir to coat evenly. Once the bread cubes are coated, immediately remove them from the pan with a slotted spoon and place them in a bowl (it is imperative to use a slotted spoon, so the bread does not become soggy by sitting in the syrup too long). Reserve the syrup left in the pan for later in the recipe. Slice a banana and add it to the strawberries, along with the blueberries and blackberries. Add in the reserved syrup and give all the fruit a good toss. Spoon some fruit into each parfait glass or bowl and then top with some of the bread cubes. Top the bread cubes with the yogurt of your choice (I use non-fat Greek yogurt). Repeat the steps until the parfaits are complete. The Elegant Occasion Note: This dish is best eaten immediately upon preparing it, so the bread retains its crispness.